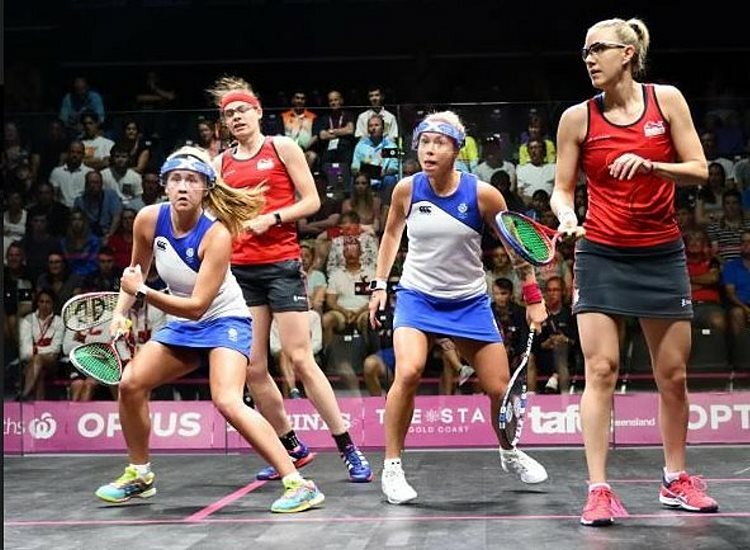 After a day two count of 30 pool matches spread across five courts, Commonwealth Games Squash action moves into the knockout stages on Thursday in the Women’s and Mixed Doubles at Oxenford Studios in Gold Coast, Australia. A crucial encounter in the Women’s event opened proceeding on the all-glass showcourt where top-seeded New Zealanders Joelle King & Amanda Landers-Murphy faced Aussie pair Sarah Cardwell & Christine Nunn, the No.8 seeds, in a match which the Kiwi world champions – after losing in Monday’s first pool match – had to win in order to progress to the knockout stage. With King, the newly-crowned Commonwealth singles gold medallist, now in the ‘doubles zone’, the favourites took just 21 minutes to see off the home duo 11-8, 11-6. “If we lost, we were definitely out,” conceded King afterwards. “I guess we just wanted to come back and try and play better than we did yesterday – it was a pretty poor start from myself. I had the afternoon off yesterday and was able to recover a bit more. Was it difficult to come down from Monday’s high of gold medal success? “Yes,” said King. “Not much sleep and all that – but we’re professionals and that’s what we’ve got to do. Partner Landers-Murphy said: “It’s a team effort – both of us were out there and we just didn’t perform as we wanted to. Today we had to come out and prove that we can play better. When asked how she was handling playing both doubles events, with different partners, King explained: “Playing match after match is not so bad, we train to switch over pretty quickly. I just didn’t expect as big a come-down from the singles. That was probably the hardest part of it. Transitioning was easy because we all know each other really well, we know what’s working. But it’s been a long week already. 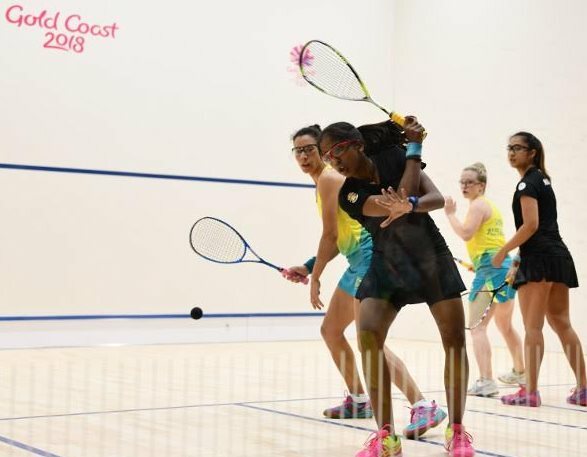 Later in the day, the Kiwi pair’s surprise first day victors Rachel Arnold & Sivasangari Subramaniam, the 9th seeds from Malaysia, completed a second successive upset win by fighting back from a game down to beat Cardwell & Nunn 10-11, 11-6, 11-5 – thereby topping Pool A, ahead of fellow qualifiers King & Landers-Murphy. New Zealander Paul Coll was also rapidly adjusting to doubles play after battling to silver in the men’s individual final less than two days earlier. His first of the day’s two matches was a men’s fixture in which he partnered Campbell Grayson to an 11-4, 11-10 victory over Maltese pair Bradley Hindle & Daniel Zammit-Lewis. Coll continued: “Since the individuals started I haven’t had time to play any doubles – but it comes back pretty quickly. One or two matches and it clicks pretty well – and we’ve got our communication sorted out which is key to us, we trust each other. Two English pairs vying for a places in the Women’s quarter-finals were placed in the same qualifying pool – and in the morning faced each other. Second favourites Jenny Duncalf & Alison Waters justified their seeding by beating compatriots Laura Massaro & Sarah-Jane Perry, the No.7 seeds, 11-4, 11-7. Was it difficult playing their team-mates? “It’s obviously a very different dynamic to playing other countries, but in individuals we play each other all the time, so we’re kind of used to it,” said Duncalf, a former world No.2. “But, in a funny way, being in the same group could be good for us if we both get through – so then we won’t play each other in the knockout stages so soon. The No.2 seeds got off to a strong start on Tuesday by beating Scots Lisa Aitken & Alison Thomson. Later in the day Massaro & Perry clinched their place in the quarter-finals – but had to recover from a game down and battle for 50 minutes to quash Aitken & Thomson 9-11, 11-8, 11-7. Massaro admitted: “We knew there was a lot of pressure on us and we weren’t happy with our performance this morning. They won a silver medal at the world doubles, we practise with them a lot and we know how good they are. “Even though we weren’t that happy with our match this morning, we thought it would help us for tonight – and I think it did. We knew our backs were against the wall. I said to SJ after the second, if we lose this we go down with no regrets.